As lung transplants become more common, clinicians should be aware of post-transplant dermatologic complications including various herpes virus infections. As use of lung transplant (LT) becomes more common, pulmonologists should be aware of post-transplant dermatologic complications. In a recent pictorial review in CHEST, my colleagues and I describe the pathogenesis, epidemiological characteristics and clinical manifestations of dermatologic complications found in lung transplant recipients. Here I will focus on skin manifestations of herpes virus (HV). Because HVs are lymphotrophic, they disseminate readily in immunocompromised patients like LT recipients. Other risk factors include seropositive transplant into a seronegative host, absence of or resistance to antiviral prophylaxis, reactivation of latent infection and confection of two HVs. Skin manifestations are most common in HSV-1, HSV-2, varicella zoster, HHV-6 and KSHV. The immunomodulatory effect of these viruses can increase vulnerability to opportunistic infections. HSV-1 is seroprevalent in 50 to 80 percent of adult transplant recipients and usually manifests in the mouth or on the face. 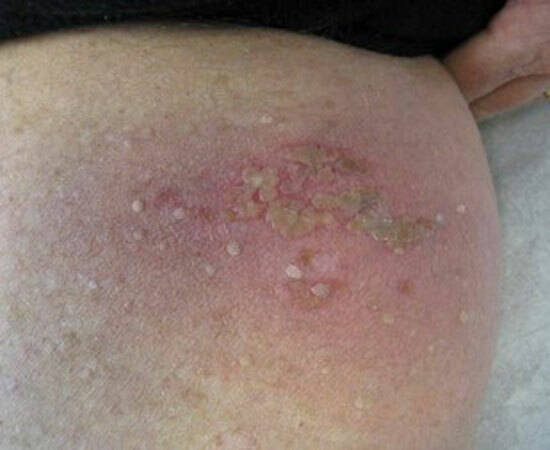 The above images show less common HSV infection of the abdominal wall and the upper thigh in transplant recipients. HSV-2 is less common and most often causes genital lesions. HHV-6 A is common in adults. HHV-6 B is common in children and causes most reactivations in transplant recipients at rates between 20 and 28 percent. Seroprevalence is 100 percent in adults and commonly reactivates early after transplant. Reactivation can be asymptomatic or associated with fever and cutaneous eruption as erythematous macules and papules surrounded by a white halo. Enanthem eruptions are Nagayama spots and ulcers on the uvula and palatoglossal junction. Coinfection rates with cytomegalovirus are high. Zoster rates in transplant recipients are between 3 and 25 percent and are more common in older recipients of thoracic transplants receiving mycophenolate-containing immunosuppressive regimens. Lesion scabbing can be a more protracted process in lung transplant recipients. Patients with higher risk of developing zoster and other herpes virus infections should be screened regularly and educated about the importance of skin surveillance. I urge any transplant pulmonologist to incorporate counseling, treatment, education and referral to appropriate specialists into their post-transplant visits. Images are republished with permission from CHEST. News and insights for health professionals on dermatology and plastic surgery from Cleveland Clinic’s Dermatology & Plastic Surgery Institute.